What is the appeal of one myth over another for an artist or his patron? Why did Rubens paint The Three Graces over and over again? What moved Gainsborough to paint this, his only mythological subject when he was already a dying man? And why was Diana so beastly to Acteon.Perhaps it ran in the family, her brother Apollo had Marsyas the satyr flayed alive after losing at a musical duel. 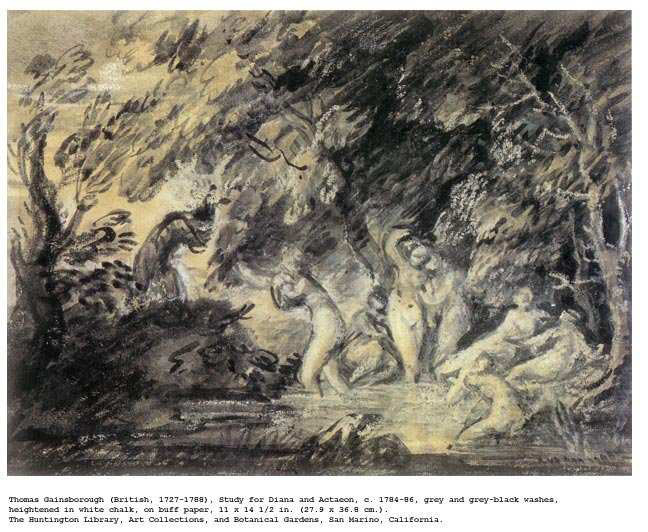 The unecessary cruelty of Actaeon being torn to bits by his own dogs merely for accidently catching sight of Diana bathing appears to be part of the psycholgical shock tactics of mytholgy. When Titian painted his gruesome version of Marsayas a fellow Venetian had just been flayed alive by the Turks and he probably chose the subject himself. Mythological scenes were all the rage during the Renaissance, patrons were no longer entirely clerical. The Renaissance mind found the Bible psychologically and artistically limiting with its one God, an almost all-male cast , even Mary is written out of the New Testament after a few scenes. Whereas mythology had a wonderful panoply to choose from – and a lot of women. Diana is a curious mix of munificence and malignity. Snakes are harmless unless you step on them, and Diana is like a snake, beautiful but repellent – and dangerous. And in fact Actaeon does not actually do anything, he merely observes and and unwittingly too, by doing so he is condemned to a hideous death, ignorantia juris non excusat , taken to the extreme. It set me thinking of John Wayne Bobbitt, his behaviour was less excusable than Acteon’s but then he only lost one limb – and that to be sewn on again.